If the concepts of Yin and Yang express an energetic duality like the two poles of a magnet, the 5 elements represent 5 different phases of the Qi or Chi. This theory is the cornerstone of a lot of the chinese practics like the medicine, tha martial arts or the feng shui itself. To explain it it is turned to five symbolic elements of nature, concretely: the Fire, the Earth, the Metal, the Water and the Wood. Each one of the represents a movement, a different transformation of Chi. One has to say that the original traduction of the chinese words Wu Xing is not 5 elements, it rather refers to five moments or different phases of energy, which advices us not to fall only in the fisical association of the elements. Some authors like the Sinologist J.M Kermadec refuse to use the wrong term. 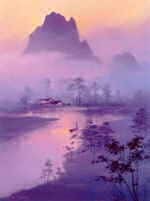 We have to understand that it is natural that there may exist certain lagoons produced by the original adaptation of the chinese philosophy to the Western thinking without counting the passing of time. By consense and general use we speak normally from the 5 elements. Let us see a description of its characteristics. The fire element is related with the energy of ascension, with the luminosity, the summer, the earth with the circular movement and therefore with the changing of the cycles, the metal with the inwards movement and the autumn season, the water with the descendent energy representing the winter and the wood with the outwards movement and the energy that appears in spring. These are just a few associations according to the movement and the natural seasons. An extremely rich range of associations interfere in the 5 elements, such as for example the fire is related to the summer and also to the heart, the red colors, to certain emotions as the stress or impatience, as well as triangular forms, etc. Each element is part of an extenese decription that allows us to catalogue the spaces weighing up the kind of energies that affect them. This relations allow making a more or less precise lecture of the events that develop or could happen in a space. 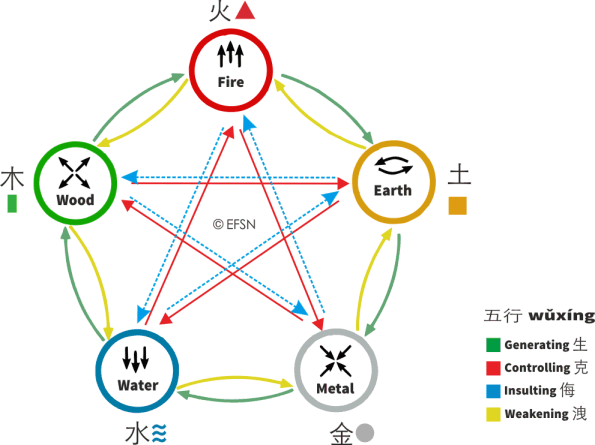 The Chinese theory suggests the need for the five elements to be in a mutual balance. Fire as an example serves to give warmth, to cook, to transform raw material but in excess it can be a big destroyer. Or like water that serves as transport and storage source but when is imbalanced can lead to floodings or extreme drought. 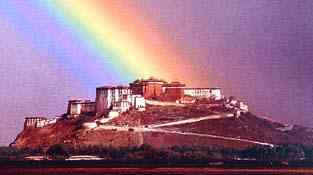 Feng Shui as a view of the natural energy can point on this disharmonies by introducing solutions that correct the problem. An example could be represented in a house that abuses of the metal element and its characteristics, using a uniform white color, polished and shiny surfaces, the element material itself, an austere and autumnal decoration, extremely order and cleanliness, and so on, that can facilitate an ambient missing joy and warmth being associated lungproblems, stiffness, or emotional feelings like depression and sadness. All this associations are part of the metal element and were not arbitrarily chosen. Before making an overview of the compounds with the 5 energies, we see a fundamental part of this theory that has todo do with the different cycles in which these elements interact. The knowledge of the cycles allows us know how these energies regulate in nature or in a particular environment. The productive cycle or of creation. Symbolically, wood serves as combustion for fire to stoke it up, as fire declines and finishes its expression it creates earth, (ashes) similar to a volcanic eruption that originates new islands, earth produces metal (minerals are extracted from mother earth's womb, in mines etc), metal after the process of smelting generates water (a liquid substance) and for the last the water element nourishes or makes wood grow, succeeding this cycle continually. Keep in mind that this explanation is a symbolic way to speak about the cycle of creation. The majority of the elements are easy to understand given its natural analogies, maybe the most difficult is the metal producing water. The controlling cycle shows a natural form to control the system, something similar to the natural balance where a fish is eaten by a bigger one that again is the food for a more bigger one. This permits a general balance as all elements are controlled and are controllers. If the controlling element exceeds the reasonable limits it can with more reason be turned into something similar to a destructive cycle. The Weakening Cycle or cycle of exhaustion. We for example say that metal is the child of the earth, an excessive extraction or dominance of this element tends to exhaust the earth. We also say that wood is the child of the water, meaning that the growing of the wood (plants, trees) diminishes the amount of water, and like this successively with each element. This cycle is a more sutile version of the cycle of control. Its application extends through a variety of feng shui methods, like the branch of Xuan Kong (flying stars) or Ba Zhai (8 houses), generally being used to weaken the elements associated to the negative stars. This cycle is the inverse turn of the cycle of controll, D.H Van Berghe explains how it turns active when the cycle of control gets imbalanced or looses coherence. Let's have a look at the cycle and some example. We could say that if the wood is very strong and metal is weak, the last mentioned will get damaged or will loose its original force when trying to control or "cut" the wood. The same would be with an intense fire that evaporates the water without giving him the opportunity to control the fire. Or an excess of water that drags the earth loosing its firmness or stability.